Background: A great concern exists in using corifollitropin alfa to induce ovarian stimulation in high responders due to the riskof OHSS.In this study, we utilized corifollitropin alfa in patients with the potential of being high responders, in addition to the GnRH analogue triptorelin, as final trigger to induce the oocyte maturation. An intensive luteal support was administered to allow the transfer in the same cycle. Patients and methods: Between January 2013 and September 2014, 35 patients were stimulated with corifollitropin alfa and underwent in vitro fertilization or intracytoplasmic sperm injection procedures. All women had levels of antimullerian hormone>3 ng/ml and antral follicle count >10 and <20. The patients with polycystic ovarian syndrome were excluded from the study. 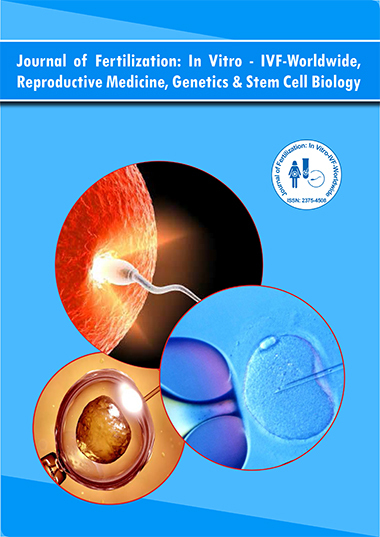 Results: The mean number of oocytes collected was 13.95 ± 6.04, the mean number of oocytes inseminated was 5.11 ± 1.66, the mean number of embryos obtained and transferred was 3.13 ±1.61 and 2.11 ± 0.92, respectively. All patients received a fresh embryo transfer,and the luteal phase was intensively supported by triptorelin and progesterone.A part of oocytes (2.47 ± 4.28) and blastocysts (0.39 ± 0.75) was vitrified.The clinical pregnancy was achieved in 15 patients and the ongoing pregnancy in11 women. Cumulative ongoing pregnancy rate, including the pregnancies achieved after thawing of eggs or embryos, was 39.47%. No OHSS were observed. Conclusions: Corifollitropin alfa plus triptorelin trigger elicits a safe ovarian stimulation in the potential high responderpatients.